The Netherlands, although not well known for its music, is home to some of the best music festivals throughout Europe. Travel there and you’ll be treated to seeing some of your favorite local and international artists live and loud. Whether you live in the Netherlands or are simply thinking of visiting, these Dutch music festivals are definitely worth dropping in for. Taking place in Tiel on the second weekend of September, Appelpop, a two day festival, is popular with international visitors and festival-goers from the UK who hop over thanks to ferries from Harwich to Hook of Holland. Since the pop festival first began in 1991, it’s become the biggest festival in the Netherlands and on top of that, it’s free! Bringing in over 100,000 people each year, visitors come to enjoy some of the best pop and rock music in the Netherlands. it might not be a long lasting festival but for anyone who is tight on their budget and wants an exciting weekend, the Appelpop festival won’t disappoint. 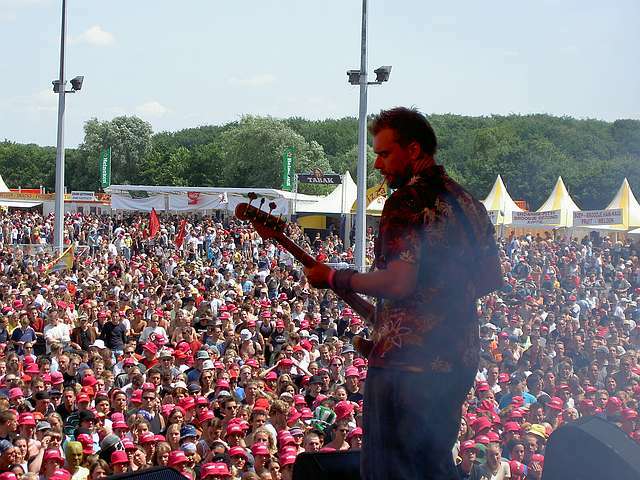 The Pinkpop festival started up in 1970 and has been going strong since with around 60,000 people coming each year to enjoy rock, electro, indie, hip hop and garage music. Held in Landgraaf during the Whitsun weekend which starts on a Saturday and ends on a Monday, you’ll find three stages that host over 38 acts. Tokens can be purchased at the stands in the festival area which will be used to purchase your food and drinks since you won’t be able to bring your own into the event. A Campingflight to Lowlands Paradise is one of the best Dutch music festivals of the summer. Commonly known as Lowlands, this festival brings in 55,000 people every year and has over ten stages which play host to around 200 different acts. First organized in 1967, Lowlands didn’t meet up to its expectations until the following year in 1968 when many people had to be turned away because its capacity of 18,000 people was sold out. The modern day Lowlands festival takes place over three days in the middle of August kicking off on a Friday and lasting through to Sunday. Taking place in Biddinghuizen next to the Walibi Holland amusement park, music lovers can also look forward to being treated to standup comedy, films and live theatre. The Mystery Land music festival attracts around 80,000 visitors every year and is widely known has the Dutch festival with the most diverse line up. Music aside, Mystery Land also has some great local food and art on offer. Held on the last Saturday of the month of August in Haarlemmermeer, this festival is designed to make visitors feel as if they are part of a fairytale with its unique decorations and themes. What’s more? You can also buy vinyl records in their very own festival store. The Dance Valley festival is held on the Spaarnwoude Recreational Grounds each year and welcomes over 50,000 eager clubbers with electronic music that can be heard for miles. Dance Valley is said to be the Woodstock of the Netherlands with performers and DJ’s coming in from all over the globe to show you their amazing talents. This festival is held on one day in July but it’ll leave lasting memories that’ll make you want to keep going back each year. The best Dutch music festivals happen all over the Netherlands. No matter what kind of atmosphere you’re looking for; they all have special qualities that’ll draw you in.